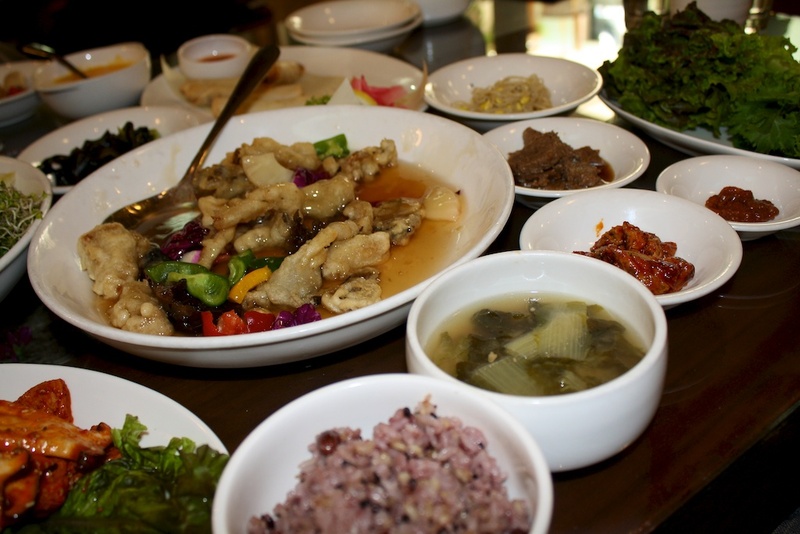 The first vegan restaurant we ever visited in Seoul (years ago), Oh Se Gae Hyang, remains one of our very favorites. It’s also located in Insadong, one of our favorite parts of Seoul. Insadong is a great neighborhood full of shops catering to tourists but also an array of art galleries, tea rooms, antiques, and of course yummy restaurants. Oh Sae Gae Hyang, which translates to “Scent of Five Worlds” is a Buddhist restaurant, and while not a Loving Hut, features the leader of the Loving Hut franchises with photos and art on its walls. It offers sit down dining, Korean style, meaning you sit cross legged on the floor on pillows. Although we really love Oh Sae Gae Hyang, we don’t tend to be too adventurous because we like our favorite dishes so much. This proved true again this time as we ordered vegan gochujang bulgolgi and pyogobusut-tangsoo. Accompanying us for lunch was a friend also visiting Korea who is allergic to garlic – which makes things a bit difficult in Korea. So we started off with spring rolls and ordered a salad for him. 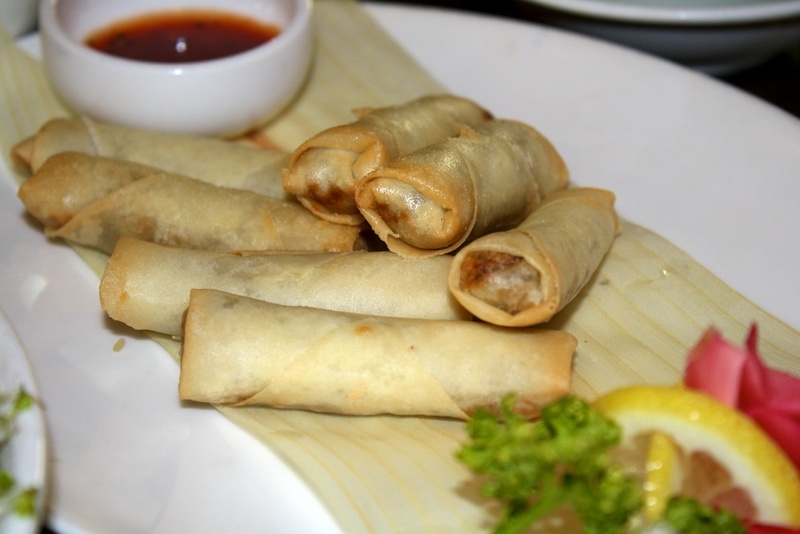 We ordered the spring rolls for the first time, and to be honest, they were least impressive thing we’ve had here. They had a mushroom filling but not a great deal of flavor. The salad had a nice variety of greens and came with a little of bit of fried faux meat and suited Charlie just fine. For Sunnie and I, we had to have our favorites. These were the dishes we got the first time we came to the restaurant and seem to end up getting up almost every time. 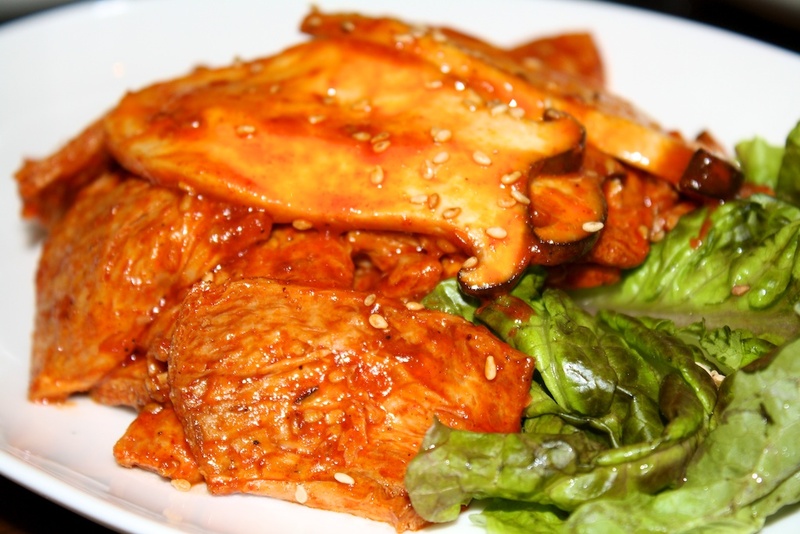 Pyogobusut-tangsoo is a fried mushroom dish with a sweet and sour sauce on it. Oh Sae Gae Hyang was the first place I ever had it, and we keep coming back for more. It’s actually often served as a dish to have when you’re drinking but of course not always. We always completely devour this when we get it here — so good! Besides all the banchan and the doenjang jigae, we had gochujang bulgolgi. 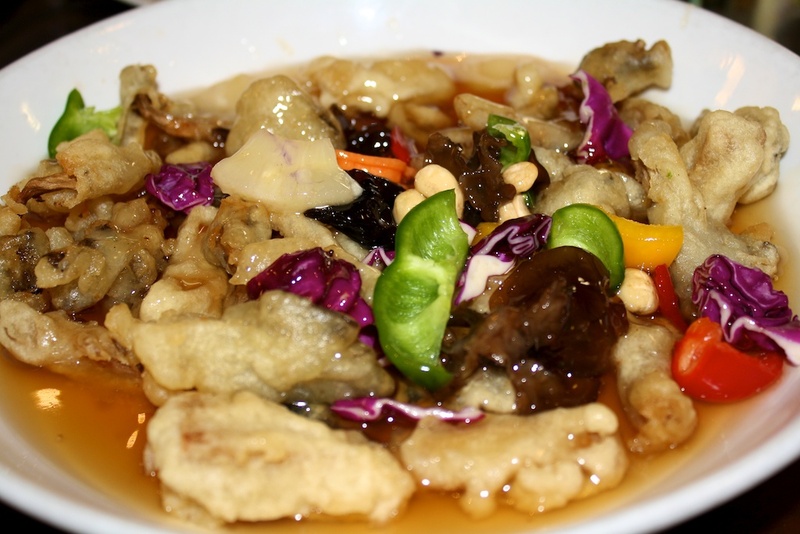 Although not as spicy as ours, it is very yummy, tender, and as you can see, served with mushrooms as well. We received plenty of greens to wrap it up in. Mmmm, mashisayo! We always find our way back to Oh Sae Gae Hyang when visiting Seoul. 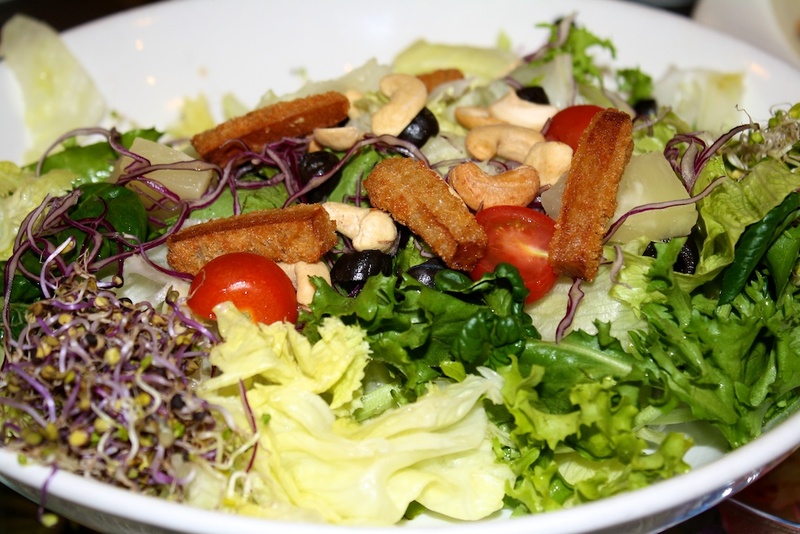 Omanim has also taken her friends here a number of times to experience vegetarian dining. 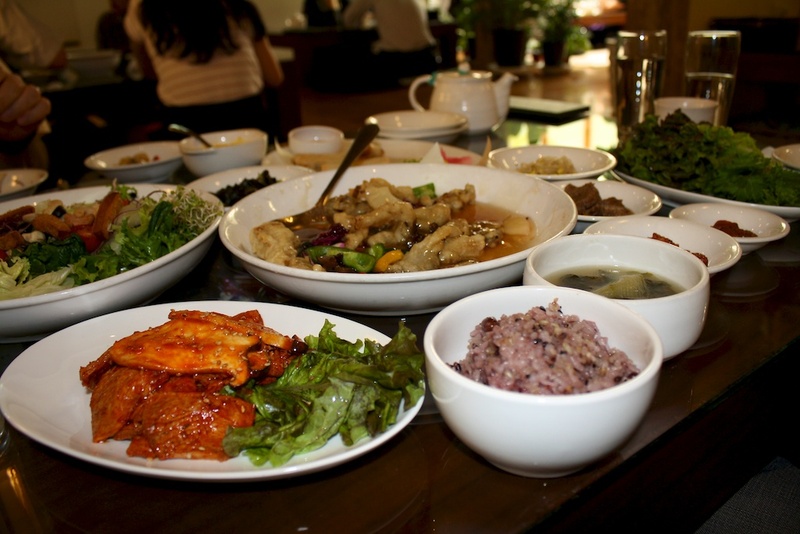 If you’re heading to Seoul, make sure to check out Insadong and definitely give Oh Sae Gae Hyang a try. Details are available at Happy Cow and Oh Sae Gae Hyang’s website. Oh my gosh! I’m almost positive I ate here (twice)! Where I went was in Insadong, Supreme-Master-related, huge menu, nice food. However, I went to their website just now, and it looks as though, if it’s the same place, they’ve renovated. It looks a bit nicer than when I was there. I seem to remember different/less art on the walls, and a kind of confused entryway with brochures and a rickety shoe rack, instead of the slick look they have now. That place was a lifesaver. I went there with three friends who were in Seoul (one Korean who lives there, one Korean who lives in the US and was just visiting, and an American who is now making his home in Incheon), and we needed a veg place for me. We shared a bunch of dishes and it was very satisfying. Then the next day, I was totally set on going back and having their vegetarian jjajangmyeon for lunch–but I couldn’t remember the name or the exact location. Oh, man, I hate to admit how long I spent looking for it, but it must have been at least an hour going up and down the side streets looking for a familiar exterior and even stopping in at the tourist information office. LOL. I would not be denied my noodles! And eventually I won the battle. The jjajangmyeon was delicious, by the way. You probably did. It’s the only Supreme-Master related restaurant I’m aware of in Insadong. You must have liked it if you searched so hard for it! It’s funny that you commented on the renovation because there wasn’t one. We noticed the same thing when we visited their website, that the pics must be very old or something because it doesn’t look like that and never has since we’ve been visiting it. We’ll have to try the jjanjangmyeon there. I actually was able to get some at a non-veg restaurant near our apartment that they kept vegan for us. It was the first time I actually have had it Korea. After thinking it would be ridiculously hard to find vegan restaurants in Korea, some friends and I actually found this by accident the other week. We didn’t go in the end because my friend can’t really handle soy or spicy food, and she was worried that she wouldn’t be able to find anything to eat. It looks great though! I shall definitely have to go back soon. Do you recall what the prices are like? Hi, Becky! Prices range from 5,000 to 15,000 won (so around $5 – $15) for entrees, so it’s not expensive. You should definitely try it. Also, be sure to check out our restaurant post category in the menu on the right to see some other vegan restaurants to try while you’re in Korea! I’m planning to visit Korea next month. May I know how to get here? Since me and hubby cannot read and speak in Korean. Because I checked in Google maps but the place seems like incorrect. Thanks for your help. Hi Vera. To get there, you’ll most likely want to take the subway to Anguk station, or you’ll be dropped off by Taxi at that entrance to Insadong (you can just be asked to be dropped off at the entrance to Insadong near Anguk station, and they should know what you’re talking about). I’m trying to do this from memory, so you’d be better off using the tourist map at http://emap.visitkorea.or.kr/Scripts/EngMap.aspx to map the address. But from my memory, there’s the one primary street that runs down through Insadong, and you’re going to take a left onto I believe the first side street you come to (you’ll walk past an initial block of art supplies and tourist shops before you come to the side street), and it’s at the end of that street. Again, I’d recommend using the map I linked to in order to be sure. There’s also an Insadong tourist center on the map, and they have paper maps of the Insadong area with a directory that you should be able use too. Good luck and enjoy!